Since its inception in 1920, football has had a great fan base especially in North America. While it is yet to make its name in the world stage, it is still the most profitable sport in the world with teams in the NFL entertaining people while making the most money. This is mainly attributed to a number of factors. Football has a very unique fan base. Supporters rally behind their teams with devotion and pride even bordering on obsession. This is no surprise why ticket sales are a major source of revenue for clubs with seats being booked way in advance and stadiums filled to full capacity. The super Bowl has become more of a cultural event that leaves the fans all over the world at a standstill, focusing mainly if not fully on football. In no sport is the defense more exciting and intriguing as football. In as much as offense is the main cup of tea for sports fans, the defense strategies and exciting plays by football stars jacks up more adrenaline than in any other sport. The fact that there are so many ways simple plays can impact a game so greatly is also a contributing factor to the sports increasing fan base. With entertainment being more important than ever before, football is already in place to receive billions of dollars a year from TV deals alone. This is a very high premium for the scale of entertainment the NFL offers to audiences. Advertisers fork millions for spots during the super Bowl so as to reach the masses. It is something marketers are willing to pay premiums for. With only 16 matches to be watched during the Super Bowl, every fan is at the edge of their seat for every minute of each game. This gives clubs in the league bargaining power for very high broadcasting revenue. The broadcasting rights for each of the games are highly contested giving clubs a huge advantage in terms of the offers made. The league is ranked among the top ten ranked shows and broadcasting revenue is the major source of the sport’s profitability. Deals made for broadcasting can total the sales of the National Basketball Association and are over those of the English Premier League. Besides TV deals, the NFL also takes advantage of its popularity and high-ranking to secure great deals for Internet streaming rights and mobile apps. Such rights can go for very high annuities and contribute to the revenue streams of tickets and television. In the same way football is able to attract big firms to get into contract deals for huge sums of money for broadcasting rights, so is the case for sponsorships. Large firms cut deals with football clubs and players alike, adding to the growing profitability of the sport every year. 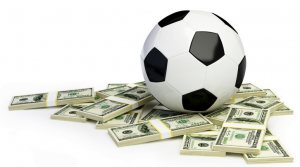 In fact, the revenue streams are increasing every subsequent year to include online betting among others. When it comes to making money, baseball, soccer, basketball or even those who play pokies at All Slots Casino may be a good means but combining them with football betting makes it all worthwhile and spreads the chances of winning.